On our way from Lima, Captain Giske kept updating us on the weather at Easter Island. The predictions all called for rain and temps in the mid-70s. It sounded a bit depressing and sure enough when we awoke we saw the deck outside our window was wet with rain. As we dressed and ate breakfast we realized the ship was still maneuvering and thought that strange. Soon we discovered why. As we stood in line waiting to get to the tender to take us ashore, the announcement came that they had needed to move because we were near the end of the runway and surprisingly enough there was air traffic. But once the ship had moved, there was also the need to evaluate the safety of running the tenders in the large swells that were present. After an hour’s delay, it was decided that they could do it but warned guests that anyone who had problems with walking or balance needed to stay on board. It didn’t stop a lot of those with canes from going and kudos to the crewmen who helped them on and off. The sun broke through the clouds and we had a sunny ride albeit a bumpy one to shore. 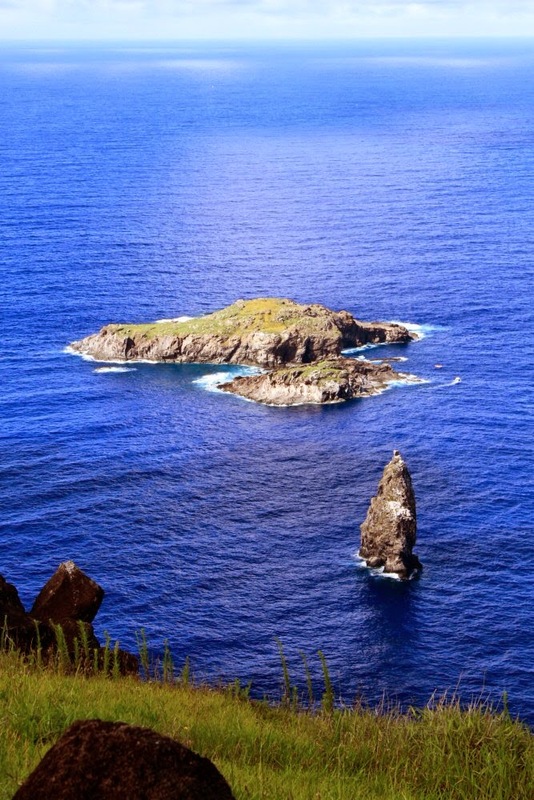 As we neared the small harbor you could tell that this was definitely an island formed from volcanic action. 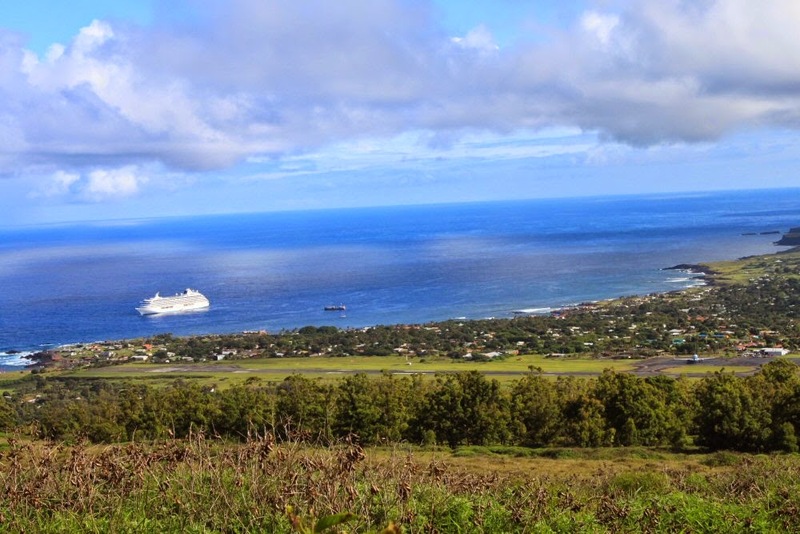 A garden of sharp volcanic rock was near the entrance to the harbor and I wondered how many ships had been lost there. Once ashore, the leader of our small private tour found his connection and our adventure began. Our first stop was to get snacks for lunch since we would be far from town. Our guide took us to a small deli and we each got an empanada and more water to take with us. The empanadas we got were called Neapolitan and had ham, cheese, tomatoes and some greens stuffed in them. They were delicious when we ate them later. One more stop to buy our park tickets and then we were off to see the village of Orongo. It sits on the side of a huge volcanic crater that now has a shallow lake in it. 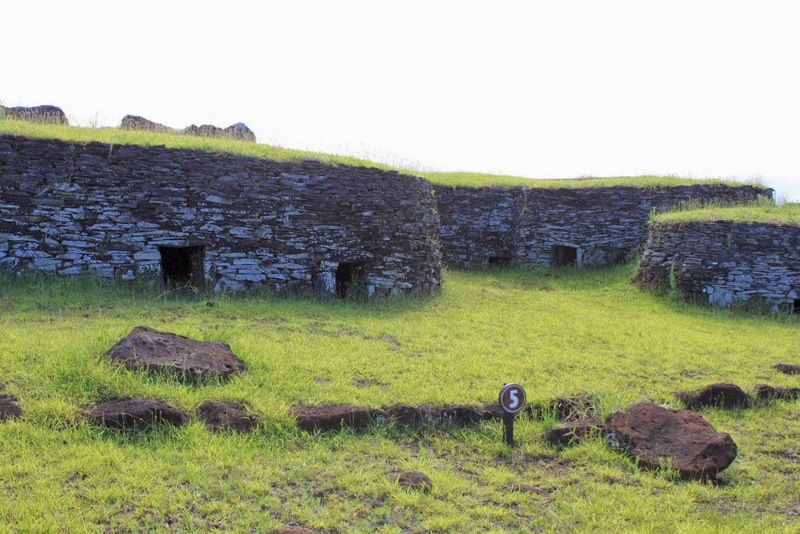 Orongo is believed to be the ceremonial site for the birdman cult. 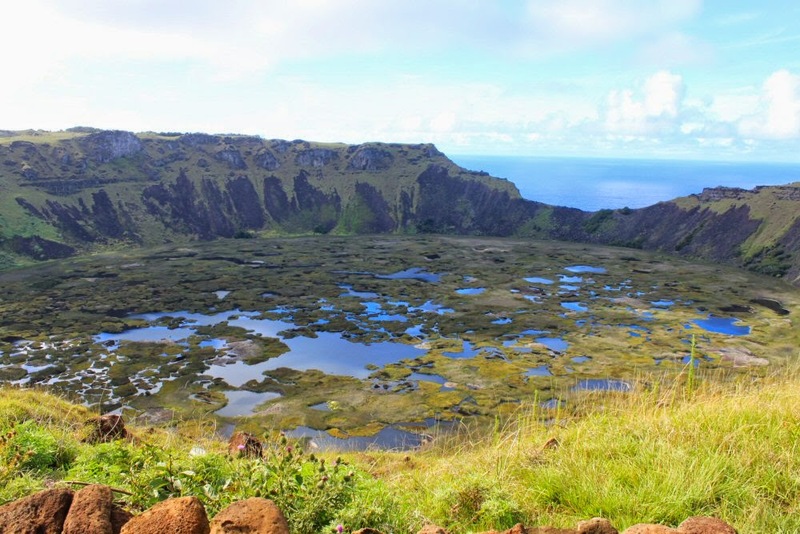 The Rapanui would gather here for the ceremony where representatives of the tribes would send men to climb down the mountainside of the volcano to the sea and swim out to an island called Motu Nui where the sea birds came each year to lay eggs. The swim was quite a distance—over a mile but they did it lying on long thin floats made of reeds. A special headdress allowed them to bring an egg back while keeping their hands free for the return swim. The first man back with an egg safely intact gave his tribe the honor of ruling the island for a year. The village was all made of flat stone houses. The one house we could see into had a large stone in the middle for support. The entrances were all small allowing for only one at a time to crawl through. It was quite a security system. By the time an intruder stuck his head in it was probably pummeled or removed. 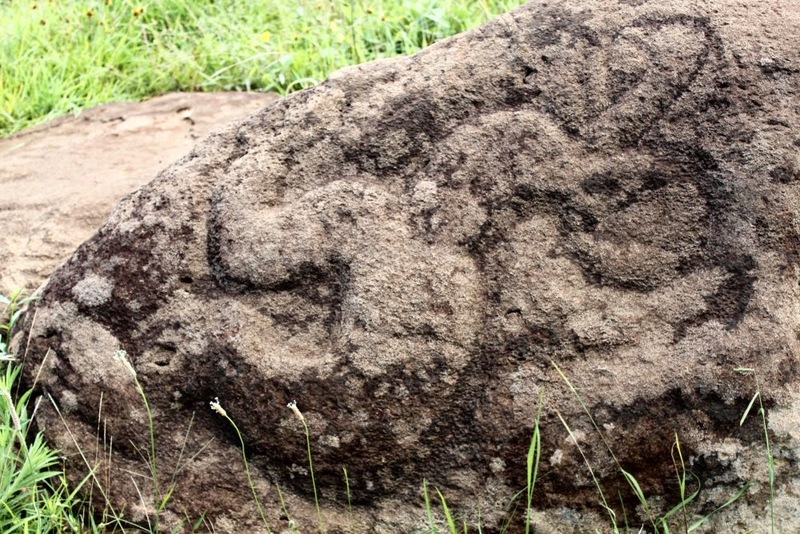 There were examples of petroglyphs (carvings and paintings in stone) that were removed years ago by others, some from foreign countries, and not many were on display in the area. Much restoration still needs to be done and I’m sure there is a lot to be discovered yet at this UNESCO site. Back in the van our guide told us our next stop was to see some Moai. A little cheer went up from the nine of us. This is what we’d come for. 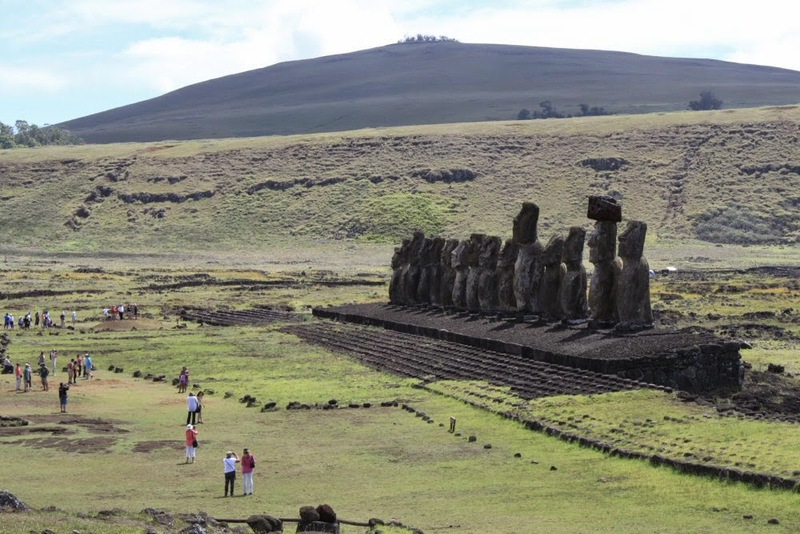 It was a bit of a drive to the spot called Ahu Tongariki, the largest stone platform that held Moai. 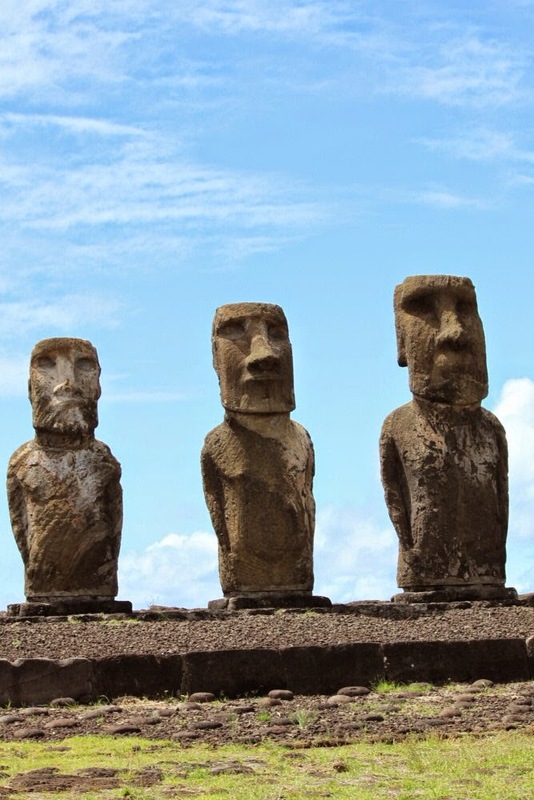 These Moai have had a rough time of it. They were toppled during civil wars and they were also washed far inland during a tsunami. The restoration has placed them all back where they were originally, facing the village that once was before them. Our guide said that many believe the Moai were there to scare away unwanted visitors from the island long ago but his information was that the Moai were made as monuments to the ancestors and would watch over the village before them. Whatever the reason, they were certainly imposing figures and each was its own character. At one time they all sported hats but they haven’t been sorted out and replaced yet. In the distance was a huge hillside of stone, the quarry where these and the 1,000 other Moai were cut out using only the harder stone of the island that could cut into the volcanic rock. That would be our next stop.